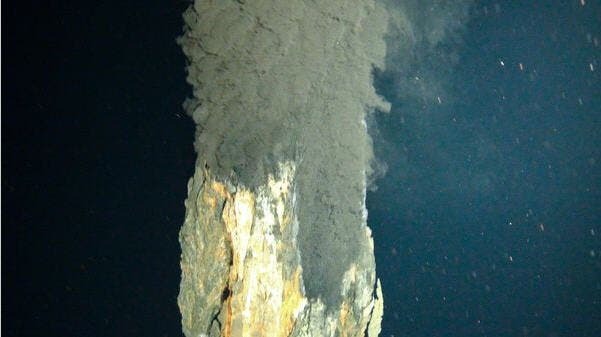 More than three miles down in the Caribbean Sea, a remote-controlled vehicle has filmed the world's deepest "black smoker" vent: a gusher of iron sulfide so hot it could melt lead. "It was like wandering across the surface of another world," the geologist who piloted the vehicle told LIveScience. "The rainbow hues of the mineral spires and the fluorescent blues of the microbial mats covering them were like nothing I had ever seen before." Despite the extreme heat, alien-like creatures thrive near these vents, including tubeworms, giant clams, and eyeless shrimp. The discovery shows that terrestrial organisms have an extraordinary ability to thrive in extreme conditions ranging from cold, acidic, and boiling black smoker habitats. For hyperthermophilic prokaryores, the optimum temperature for growth is above 353 degrees K (80C/175F). Pyrolobus fumarii, an iron breathing bacterium has been found to tolerate as high as 394 degrees K (121C/250F), setting the record for the highest temperature known to be compatible with life. Earth's extremeophiles raise one huge unanswered question: can life begin in such an environment? Life can adapt to extreme environments, but can it originate there? If extremeophiles do not need Goldilocks type mild environments to evolve, we can then imagine a stunning array of possible lifeforms throughout the universe, ranging nearby from the clouds of Venus, to the methane lakes of Titan to the depths of Europa's ice-covered seas.